The Hollywood of the 1930s and 1940s was the heyday of the child star, those famous youngsters who brought joy and happiness to millions of moviegoers around the world. This website is dedicated to one of the most talented child stars to ever appear in front of the movie cameras. 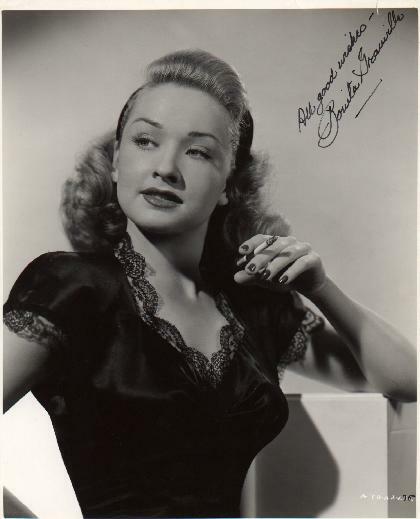 Someone who, sadly, does not receive as much attention today as her peers do...the one and only Bonita Granville. This page is not affiliated with or approved by Bonita Granville Wrather's family or estate, nor any organization which employed or is associated with her. It was constructed by a fan, who wishes to create a resource for Bonita Granville's fans everywhere. If you have any comments or questions, or just want to drop a note and say "Hi!" please feel free to e-mail me by clicking on the icon above. Be sure to use the subject heading "Bonita." Thanks! This page is best viewed with Netscape Navigator 4.0+. If viewed with any other browsers (including Microsoft Internet Explorer), the page alignments will be off to the left. I apologize for any inconvenience.